I would like to say that a lot of my crunchiness comes from my wanting to keep harsh chemicals off my children, and that would be true...to an extent. It's also because I am extremely cheap and making your own anything is much cheaper than buying it. So, there you have it. The deep thoughts of Jessica! 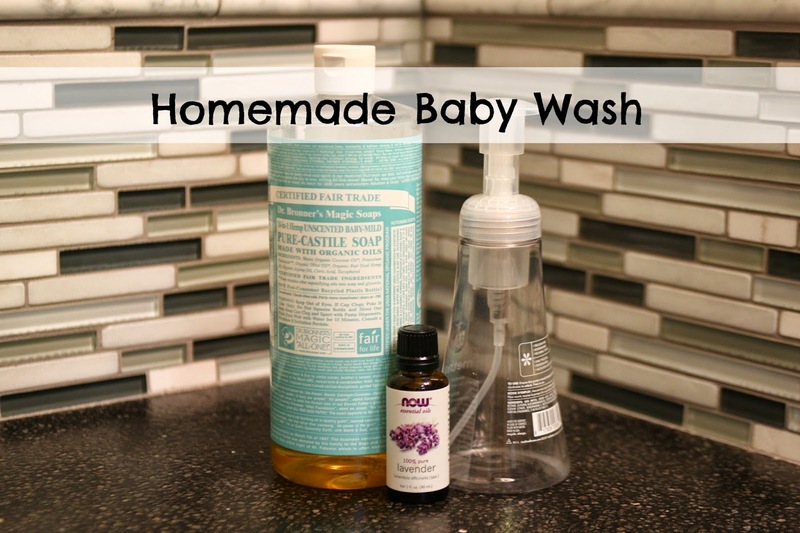 Homemade baby wash is about the easiest thing ever to make. I shouldn't even call it "make", because it is just mixing a couple ingredients together. I put mine in an old foam hand soap dispenser so it makes the baby wash foam when coming out. 8-10 drops of essential oils of your choice. This one is completely optional. Dr. Bronners baby castile soap already has a nice scent to me, so I really don't think essential oils are necessary. But I have put them in before. Lavender really complements the scent nicely. One thing I would like to point out is this needs to be kept out of kids eyes, as it isn't "no more tears". I could give you a lesson on how the whole no more tears thing is actually numbing agents, but you can research that yourself. That being said, I have used this for a year or so without either one of my children crying out in pain from soap getting in their eyes. And even though I have labeled this "baby" wash, this is what my kids use as shampoo and body wash. It works great for us. And they (especially Connor) love pumping out the "bubbles" and washing themselves with it. I know there are a ton of slightly different baby wash recipes out there. If you happen to use a different one, please share it, as I am always up for trying new things. Thanks for this!! Also where do you find the Castile soap? You can get it at Target.